Superb quality audio from this 2019 Remastered Hybrid Super Audio Disc containing Stereo and Quad Mixes of this Ravel / Tomita symphonic classic! Lovingly Remastered from the Original Analogue Tapes by Michael J. Dutton, a highly regarded audiophile engineer working in the Super Audio / Multi Channel audio field for what is arguably the late Isao Tomita’s most symphonic and most true to the original work ever produced! First released in Japan and Europe in 1979 as ‘Daphnis et Chloe‘, this fantastic recording was also known as “The Ravel Album” and ‘Bolero’ when it was released domestically in America. It contains some of Maurice Ravel’s finest creations – real fantasy orchestral / choral pieces that sit well in the collections of both Electronic Music and Classical Music fan’s collections alike and it proved to be perfect music for Tomita to realize electronically on his keyboards and synthesizers. 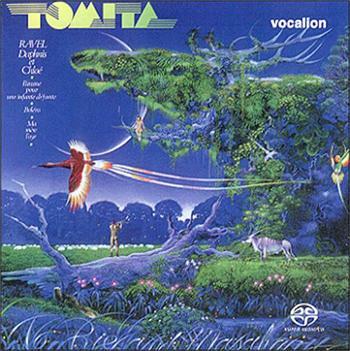 ‘Daphnis et Chloe‘ is for me is a huge personal favourite that in my opinion actually bettered its closest Tomita rivals in many respects, which were among others, the best selling: ‘Snowflakes Are Dancing’ (Debussy) from 1974 and Tomita’s controversial 1976 adaptation of Holst’s: ‘Planets' suite. This 2019 SACD (Super Audio Compact Disc) is a Multi-Channel Hybrid that will play in ALL CD PLAYERS, but offer it’s full glories when played in a machine that has Super Audio Discs capabilities, whether it be in 2-Channel Stereo or Multi-Channel mode. This Tomita title comes in a Jewel Case that contains a standard 4-Page Booklet with a copy of sleeve notes originally written by Masahiro Ogi - scholar and film music commentator – for: ‘Bolero’, the US issue of the ‘Daphnis Et Chloe’ album, and a copy of the completely different artwork that was produced for that US version is featured on the back page of the booklet. The disc’s playing surface has a gold tint and there is a genuine feeling of quality with it. Accessories: AKG BX20E Echo Unit / AKG BX10 Echo Unit / Roland RV 800 Stereo Reverb / Roland Revo 30 / Roland Stereo Phaser PH 830 / Korg Synthesizer Interface x 4 / Binson Echorec “2” / Roland Space Echo RE 201 / Roland “Dimension D” / Eventide Clockworks “Instant Phaser” Eventide Clockworks “Instant Flanger” / Eventide Clockworks “Harmoniser” Fender “Dimension IV” / Fender Electric Piano / Hohner Clavinet C / Mellotron Leslie Speaker Model 147. ‘Daphnis et Chloé’ was released on 17th January 2019.